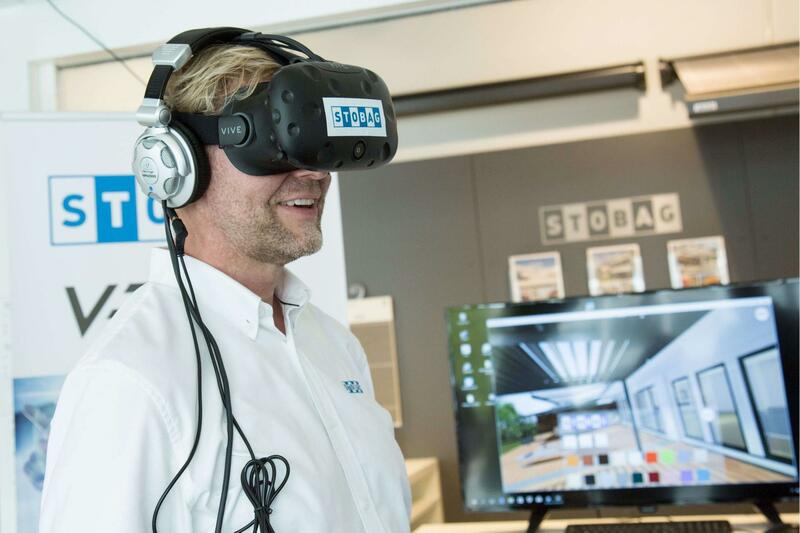 Made possible by Virtual Reality: At trade fairs and in selected presentation rooms you can now get up close and personal with our STOBAG products. You can immerse yourself in different scenarios and experience the colors, shapes, sizes and materials of the shading and weather protection systems in their original spatial context. STOBAG is known for its high standards with regard to product design. Renowned awards such as the reddot confirm the perfect symbiosis of quality, technology and design. But STOBAG also focuses on individuality and maximum flexibility. Whether it is a sun awning or a weather protection solution - STOBAG products are always tailor-made. In addition to special material types for a wide range of applications, you can choose from over 300 fabric designs that can be combined with countless frame colors. As a customer, you are always spoilt for choice. And until now, you have always needed a great deal of imagination of how the shading system you have chosen could work in your own home or garden. Now that' s the end: STOBAG has created new product worlds for you. And they really have it all. Virtual Reality (VR) is the key for STOBAG, a technical concept that allows us to put you in computer-generated settings that appear real and allow interaction. VR is currently conquering sales processes by leaps and bounds and has been an integral part of the gaming world with its photorealistic events for years. 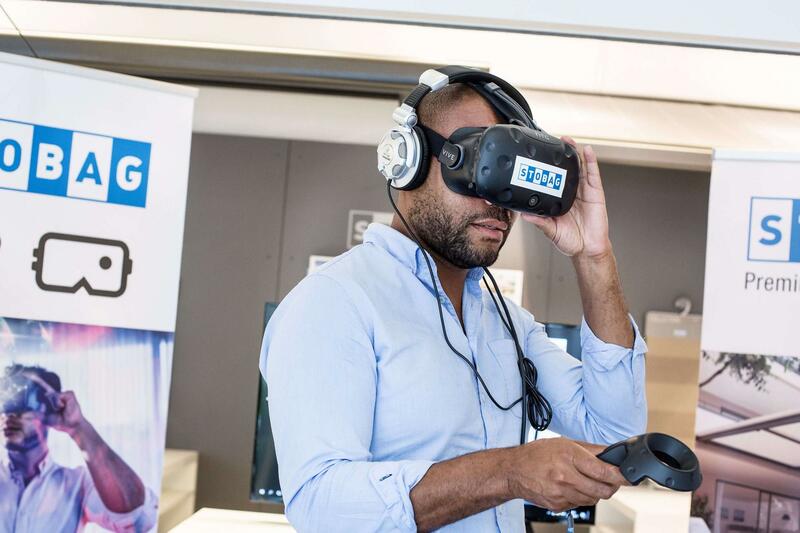 A VR application specially programmed for STOBAG, which we display at trade fairs and in selected showrooms, allows you to explore our shading systems and materials in real time and interactively. Simply put on a pair of high-resolution HTC-Vive VR data glasses and you will become the main character almost like in real life. And just like in real life, you control the desired image section with your head movements only. With these new virtual product experiences, STOBAG not only provides its prospects and customers with frequently requested live inspirations for their purchase decisions. Now everyone is able to influence the design by experimenting and comparing: You configure the desired materials, colors and functions and test them in different light and application situations. Whether in the garden, patio or balcony, whether cassette awning or glass roof with integrated shading. We can even realistically simulate the course of the sun throughout the day and time of year for you. A significant added value in the planning phase. With the help of our virtual reality application, you can discover even in the Winter, where your planned sun protection system will cast its cooling shade in the Summer. The quality of this kind of VR application depends on the visual quality. STOBAG relies heavily on photorealistic and highest performance. The product models shown were modeled in high-end rendering. The results are impressive, realistic textures, reflections and shades. The high-resolution HTC-Vive VR glasses provide a spectacular 360-degree panoramic view and the appropriate sound backdrop. Virtual Reality (VR) is a technical concept that has its origins primarily in gaming development. 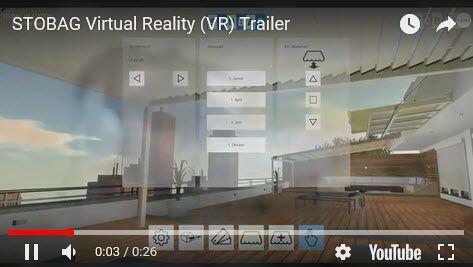 With the help of VR, the user is placed in a computer-generated scenery that appears real and interacts with him. For example, he uses VR glasses to generate a high-resolution, computer-generated 360-degree image for each eye, which is then assembled into a three-dimensional scene in the brain. The user perceives himself in the middle of the scene and can influence it. This can be a realistic looking room, a flight or even a realistic representation of a historical environment. Or - in the case of our STOBAG application - you can experience configurable product worlds. This means: with VR, the viewer becomes an actor and designer in a virtual environment. He defines the respective image section through his head movements. Pioneers of the technology industry assume that VR will shape our everyday life in the coming years and will significantly change our media consumption.